Most believe that cinema has its own language and the diehard fans would definitely agree. Yet there is a large number of growing global audiences who don’t want to miss out even a word from the dialogues. If you are watching a movie in a language that you only partially understand or if it is completely foreign, subtitles prove to be a boon. They play an important role in making the content global, instead of being focused on a particular local and narrow audience. Here we have a list of good sources where you can get subtitles of millions of movies and TV shows at a click of a button. Most of them are in SRT format and packed into zip files which you will have to extract and synchronize them with the movie or TV show you will be watching. Subscene is the most popular website to download subtitles where the content is constantly updated for all the latest movies and TV series subtitles. They are created and submitted by users themselves. Here you can discover them for rare movie titles and TV shows. The UI of Subscene is kept very simple so that people find it easy to use. 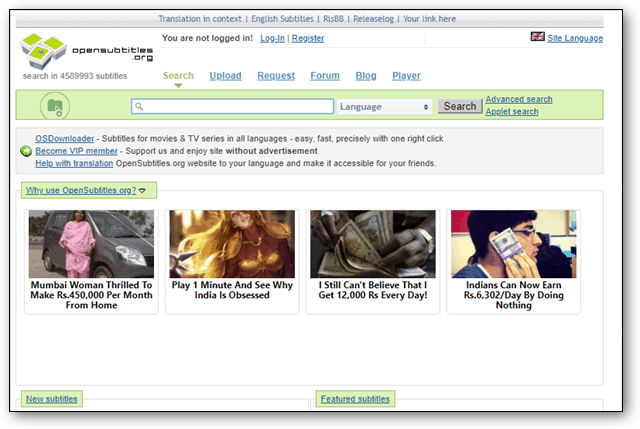 To find the subtitle that you are looking for, simply type the name of the movie or TV show in the search bar. You can then select the correct match from the results. You can even apply the filter and choose at max 3 languages to see in the search results. Open Subtitles has an excellent subs collection that you will be happy with. Although the website has the most extensive database, the user interface may seem a bit awkward to navigate in the beginning. You can filter the results while choosing your preferred language. You can even submit a request if it isn’t found. The Advanced Search lets you have an in-depth filter search before the subtitles download is done. 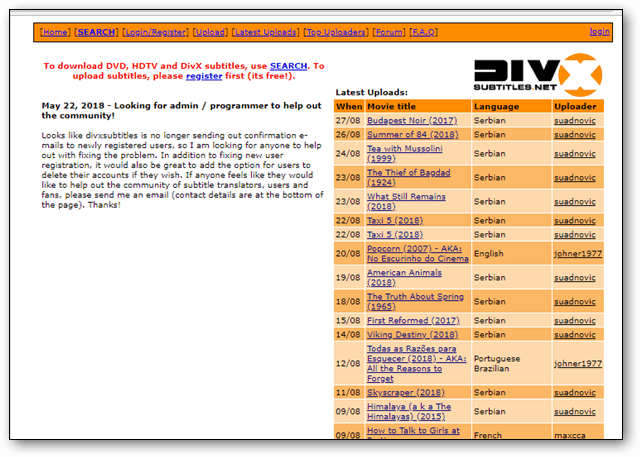 DivX is a great place to get subtitles for DVD, DivX, and HDTV. In spite of the interface being a bit old, has still boasts of a good collection. You can search for a specific show and if you want to upload it, you can even register for free. The entries are listed while mentioning the date of upload, language, and uploader. At the bottom of the page, they allow you to search for a subtitle alphabetically. Here are the latest movie dialogues along with TV subtitles on Addic7ed. Fortunately, it is not limited to only subtitles, but it also gives you relevant information about the movie or TV Show you’re searching for. The interface looks bit outdated but you will get a rich experience with the overall content. You are likely to find your favorite movie or TV show subtitle here. While TV-Subs is another useful source to get subtitles in different languages, that all are packed in a zip file. Simply unzip them and start watching your show. They have a separate section for the latest uploads. TV-Subs includes text for popular TV shows from Game of Thrones to The Big Bang Theory. You can also upload subtitles to make this website’s service better. Moreover, SubsMax is another website driven by movie enthusiasts with a technical background that helps you download subtitles for thousands of movies. SubsMax is worth a try to watch movies with properly synchronized subtitles. One of the first things that you may appreciate about this website is its new and fresh user interface. This gives out the proper description of each title and is very easy to navigate. It is a reliable source to get some latest subs and download them. The search bar is intuitive, and as you start typing the movie name, it gives suitable suggestions. This website boasts of over 2,030,875 subtitles for 56,459 movies and 6,207 series in 100 languages. We hope the statistics are enough to motivate you to explore this website and download subtitles. Podnapisi promises never to disappoint you. It has detailed search options with categories as ‘Latest Subtitles’ for movies, ‘Latest Subtitles’ for mini-series, to make your choices easier. You also have an advanced search option where you can precisely search by entering the corresponding year, name, or language of the movie or TV show you are looking for. 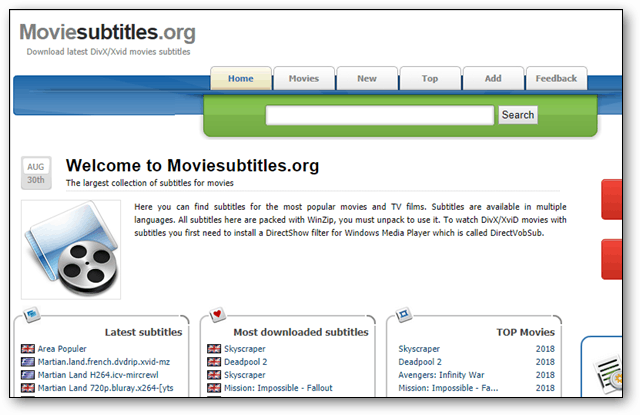 Moviesubtitles is another source to acquire the latest DivX/Xvid movies subs. It has subtitles for most popular movies and TV films in multiple languages. Currently, the website has 19238 movies with 114794 total entries. Although sometimes you may get annoyed while trying to download as you may get redirected. Try once again and you will get the download done. So now that you have multiple options to choose from, we hope you have a great time watching world cinema. Although there are probably loads of more subtitle sites to choose from, we assure you that the ones we have listed above are the most reliable and easy to use.